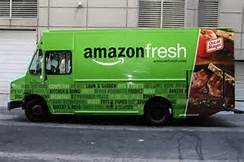 I see that the on-line retailer Amazon is waging war on the supermarkets by introducing its own fresh food delivery service, promising to deliver your order placed at lunchtime in time for supper. Amazon already sells tinned and packaged groceries but from yesterday will offer its customers fruit, vegetables and meat as part of its 'Amazon Fresh' service. Not only will this enterprise attack supermarket sales, it will also take-on the online grocer Ocado. However, it is no surprise that Amazon will charge a premium rate for their service. An annual subscription of £79 to access Amazon Prime, and thus receive a speedy delivery and an extra £6,99 a month for the food service. There will be 130,000 goods on offer in the Amazon package, including Coca-Cola, and Kellogg's plus Morrison's products, under a previously agreement announced last February. 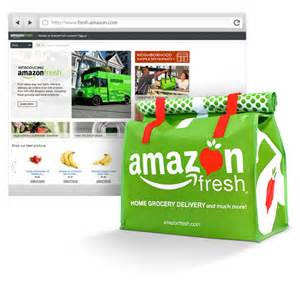 Amazon Fresh is already available in some US cities and will initially be hitting the UK market in 69 postcodes in north and east London. But there are plans to expand across Britain. Those customers who order by 1pm will receive their food by 5pm. This will certainly hit the three big supermarkets, Sainsbury's, Asda and Tesco, as well as the newer food 'stars' of Aldi and Lidl and particularly when they offer produce at cheaper prices than competitors. 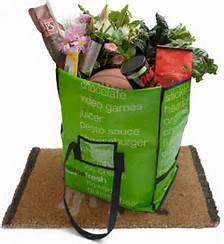 Yesterday's press reports predicted that an equivalent shopping baskets would cost £58.93 with Amazon, compare to £59.90 for the same products at Asda. So what's next for Amazon -a team in the Premier League?